Organised by Amy Bunce BSc (Hons) MA ACIfA Director of UK Operations and Palaeoenvironmental Sciences the teams were able to put down their tools and appreciate the efforts of their travail. 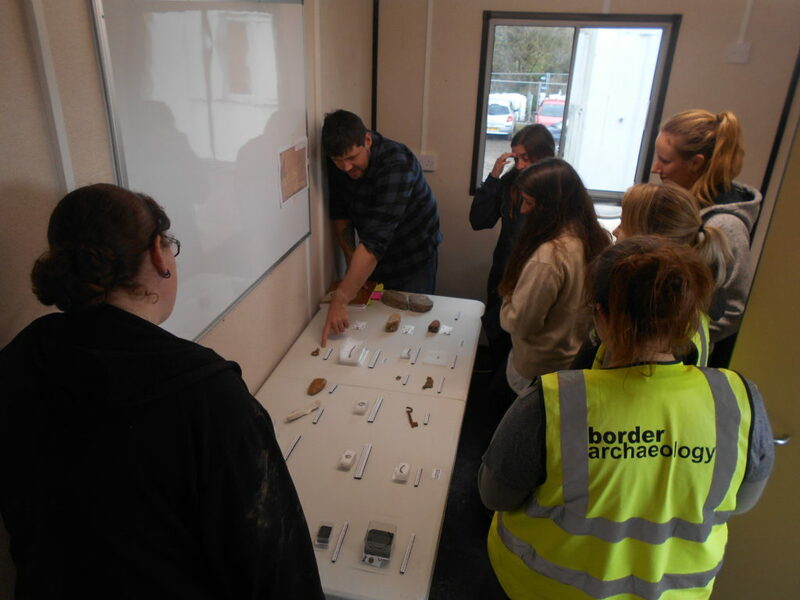 Split into small groups, each archaeologist had time to handle the finds and engage with members of the Post-Ex Team. The finds display comprised artefacts from the Western & Eastern Expansion area of Milton Keynes and a selection of skeletons from our Project Pilgrim excavation at Gloucester Cathedral. Ranging from miniature vases and items of personal adornment to larger ceramic assemblages, the teams were presented with a wide selection of finds that spanned from the everyday to the more symbolic. Skeletal remains from Gloucester Cathedral provided fine examples of pathology – on one particular skeleton the team were able to see the impact of rheumatoid arthritis. The lunch was a great success too…….41 hungry archaeologists can eat for (Roman) Britain!